If you are looking for a nice side dish for the summer grill, I have one for you. Only if you like mushrooms though. 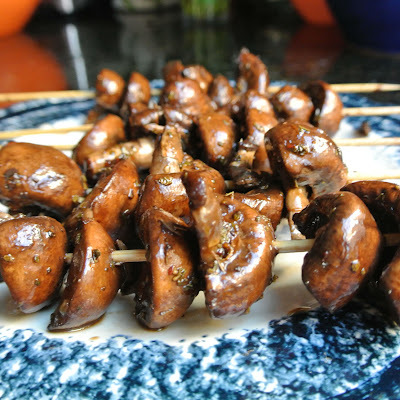 I am assuming you are a mushroom person if you clicked on the recipe. These skewers got devoured at my house, no leftovers, everyone loved them. Quick and easy to make. Whisk the red chili pepper sauce , olive oil, balsamic vinegar, and oregano together in a medium bowl. Thread the mushrooms onto presoaked bamboo skewers. Grill them, 5 minutes per side. YESS! I love it. I love love love mushrooms! I'm the only one in the family that eats mushrooms but that would never stop me from making them. I love this recipe! Thanks for sharing.